The deposit we apply for the groups (min. 8 people) is 30% of the total amount of the vacation. The cancellation is free if done at least 7 days before the check-in. If the cancellation occurs during the week before the check-in it will be charged 50% of the total amount of the vacation. As in all the HOSTELLING INTERNATIONAL H.I. 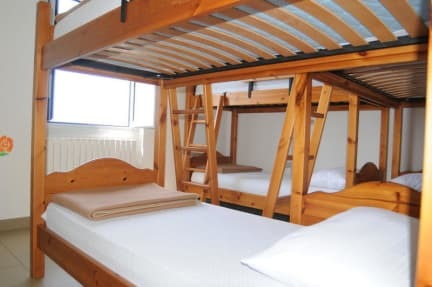 youth hostels, it is necessary to be members. On the arrival at the youth hostel, you can purchase a membership card. The card is valid for all H.I. hostels worldwide and for each night you stay, it costs €2. After 6 nights of stay in any H.I. hostels, you will receive a card valid for one year, which allows you to have discounts. The leader card, for groups up to 25 people, cost 20.00 euros and it is valid just for the vacation ongoing. The hostel, a villa dating the late Twenties, is surrounded by green, in perfect harmony with the landscape, and only 300 meters away from the Miamare Castle, once among the properties of the Hapsburg Imperial house. Quiet and welcoming, the Ostello Tergeste and its staff are ready to offer you the perfect location for a pleasant and restful vacation with your family and friends by the seashore. Payment upon arrival by cash, credit cards, debit cards. No American Express and Diners. All rooms with private facilities. Check-in from 1.30pm to 9pm. Late check-in possible upon previous request (min. 1 day before), by email or phone. Towels are not supplied. They are available to hire from reception from €1,00. Bed linen and blankets are supplied. Small pets are welcome (only in private rooms). Children are welcome. Baby crib free. A very nice hostel overall! The staff were very friendly and helpful. The location by the sea is very nice and the atmosphere with the other travellers is also great. SEA VIEWS! ok so be sure to get off before the road splits and bus 6 is AROUND the corner from the front of the train station to the left if facing the statue of Elisabeth. Very TRANQUIL - was here Sept 4-6th and so not high season. Stayed in two diff rooms -1st 6 bed was renovated with individual chargers (yeah) 2nd was group power outlet but better wood beds for less squeaking. THEY def need to get an all FEMALE dorm - so please make that suggestion. Manager guy totally nice @smile. This is a beautiful location...right on the water! The staff are wonderful! They went out of the way to help me get settled and even gave me a care package for the road when I left. It was off season, so not a lot of people here... I felt like I had the place to myself. But think I would come back even when it's busy...it was a great spot! Location is beautiful, but the transport from Trieste can be difficult at night. Last bus is around 11 pm so after you can only return with taxi or walk. Only minus was that in mixed bedroom the bathroom lock was broken and that made me feel uncomfortable. I would suggest staying. 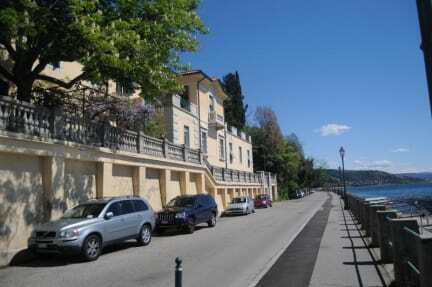 It's located right next to castle Miramare - go there right in the morning before 9:30, you will be there before all the tourists come, which provides a great atmosphere! Otherwise the bed are quite close to each other, not so much space to walk in the room. Free breakfast is a plus (if you like sweet). One of the main receptionists was this grumpy old man that didn't make me feel welcomed as a guest. It really gave me a bad first impression as well as how dirty the restrooms and hallways were. 1. About staff: Absolutely rude and pathetic night staff. There's one old weirdo who comes at the reception in night hours, try to avoid interacting with him. He was absolutely rude, doesn't know any language, but Italian, and at times actually cursed and shouted at us when asked about using kitchen. 2. Atmosphere: Everywhere I saw, I could only see old Italian people in their 60s probly. Absolutely none to interact with. 3. Free breakfast: Rubbish. Only milk and break jam. It's the only hostel in Trieste as far as I know, so my review will only upset people having no choice, sorry for that. The old guy of the staff is super rude and doesn't speak English. There are two outlets in a room for 6, rooms for 20e are in a basement, so very hot and humid. There are no facilities for cooking/making tea (i was offered to buy a plastic cup and fill it with hot tap water). Located very far from anything but sea. The upside is that it's easy to meet other travelers.